RoKo (Robyn Kocienski, if you insist) was a "late bloomer" in the realm of motorcycling. Sometime in her early 30's, she had her first motorcycle-passenger experience.. and hated it. The operator said, "Well, take the MSF course and learn how to ride!" So, she did just that. 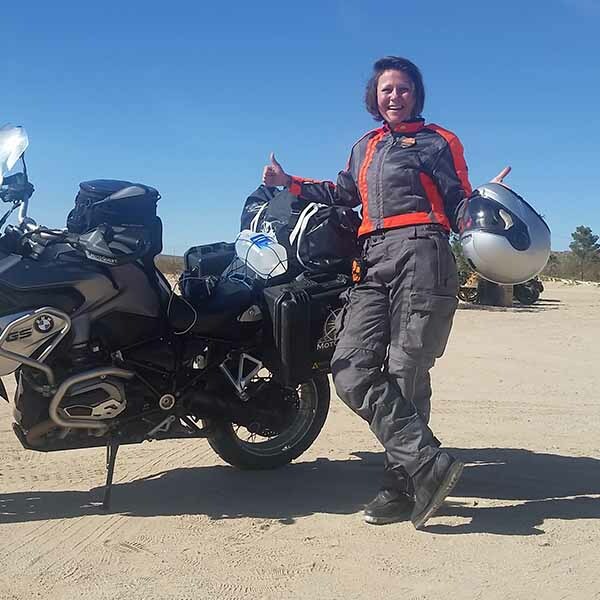 These days, RoKo gets her jollys by taking off for months at a time to ride, camp and explore with whatever motorcycle she can get her hands on. Her weekends in Alaska are no joke, either. Those long summer days mean this gal is covering lots of ground from the moment she clocks out on Friday until she's back at her desk on Monday. Quote: I can't miss you if you're here. Current Location: Wherever the herd of MotoQuest bikes are congregating. Expertise: Long distance motorcycle touring, public speaking, motorcycle rental facilitation.